Who wins an Olympic silver medal at a youthful 26 and, instead of continuing along that path in the quest for gold - the ultimate sporting peak in sharp focus up ahead - decides to head back down the mountain and start over? 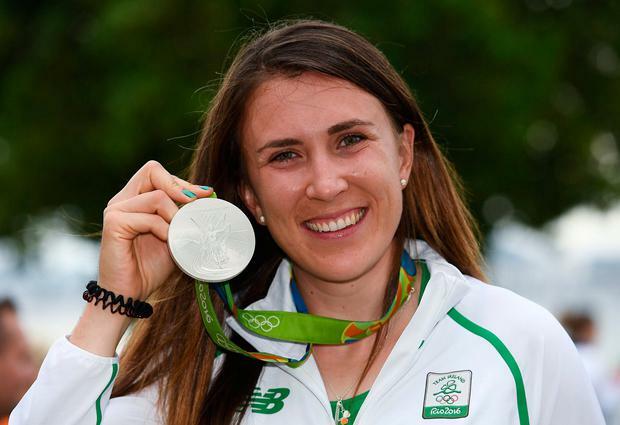 But Annalise Murphy has always been a bit different, conventional thinking a weight long since jettisoned from her vessel. Opt out of a science degree after a year to take a punt on your potential as a sailor? Sure. Sign up for a year-long, round-the-world race that will put your life - and sanity - at substantial risk? Chalk it down. Rory Fitzpatrick has a tale. He was Murphy's coach for the best part of 15 years and a witness to that outlier mentality. "Part of her is a perfectionist, it's all or nothing," he says. "Some of those qualities sit in the back of her head, but in the end they manage to beat the world when it counts." As a youngster Murphy was that rare breed who never missed training, the winds of teenage life unable to cart her off track. In the build-up to the London Olympics she would often refuse to come to shore after several hours of practice, Fitzpatrick only able to shake his head with both concern and admiration. "It was worrying that she'd want to stay out, but she just wouldn't come in if she knew what we were doing wasn't going to beat the others," he says. "Those things make her stand apart." A giant picture of that note is now plastered on the wall at the Irish Sailing high performance headquarters in Dún Laoghaire, a mobile facility which will be a centralised hub for Irish sailors in the build-up to the Tokyo Olympics. Alongside the note is an image of a tearful Murphy hugging Fitzpatrick - the pain of fourth place a powerful motivator during the daily grind. Just down the hall, however, is a very different image - Murphy in Rio in 2016, beaming from the medal rostrum. The only problem with that silver medal? The expectancy it would one day turn to gold. Murphy had barely drawn breath before she felt herself being tugged down that path. "Straight away there was this huge pressure. 'Are you going to go and get another medal? Go and get a gold in Tokyo?' My initial reaction was that it wasn't what I actually wanted, it's what I was doing to please everyone else. I'd put heart and soul into those four years between London and Rio, it was really tough," she says. She took time out to think, signing up for the Volvo Ocean Race the following year, a nine-month, round-the-world yacht race that tops many a sailor's bucket list. At least, until the hardship of it all hits home. Three weeks on the water at a time, without a shower or a toilet or a proper chunk of sleep in sight. At the halfway stage in Hong Kong, Murphy had made up her mind, booked her flight home - she was done. The thing that began to break her? "Lack of sleep," she says. "You do four hours on, four hours off, then share a bunk bed with the person who does the opposite watch. But it's rare on your four hours off that you weren't doing something. I definitely went through stages where I slept for an hour a day for three or four days." She eventually repressed the urge to quit, committing to five more months of hardship. But the perils they were facing hit home a month later when news came through that John Fisher, a crew member on a rival team, had been knocked overboard by the mainsheet and was lost at sea. Murphy was, like Fisher, a medic for her team and had become good friends with him during a week-long course before the race. "It had a huge effect on me," she says. "He was a really nice guy, had such time for all the younger people in the race and it was just awful, such horrible news. But that's this race - everyone is taking a huge risk." At the end of June last year she finally reached the finish in the Netherlands, a lifelong lesson now ingrained. "It changed me in so many ways," she says. "It showed me that something I thought I'd never be able to do, I was able to do." It's a lesson she has to draw upon again now. Since last summer Murphy has pivoted from the individual laser radial to the 49er FX, which she plans to sail at the Tokyo Olympics alongside Katie Tingle. It's four times faster than the laser, and far more complex, with those in the know saying it's like learning an entirely different sport. Murphy and Tingle can attest to that, capsizing countless times over the past eight months, with one incident leading to a broken arm for Tingle. The first true gauge of progress will be at the World Cup in Genoa next month, with December's World Championships in New Zealand the big opportunity to secure Olympic qualification. Five hours a day they're out there on the water, with another couple in the gym and another few spent poring over videos every evening. But is it feasible for Murphy to rebuild herself as a medal contender in time for Tokyo, now just 16 months away? "It's a huge work in progress," she admits. "But I like to believe it is."